Save your search - find out immediately when "Human migration" is available at auction! Two Diamond "Etoile" Rings, Tiffany & Co.
Wes Kemp (American, 20th Century) Ernest Hemingway. 18kt Gold and Lapis Safety Pin, Tiffany & Co.
18kt Gold and Enamel Earclips, Schlumberger, Tiffany & Co.
18kt Gold and Lapis Bird Brooch, Schlumberger, Tiffany & Co.
Retro 14kt Bicolor Gold Bracelet, Tiffany & Co.
14kt Gold Pen, Tiffany & Co.
18kt Gold Cuff Bracelet, Tiffany & Co.
14kt Gold Earclips, Tiffany & Co. Platinum Band, Tiffany & Co.
18kt White Gold and Diamond "Atlas" Earclips, Tiffany & Co. 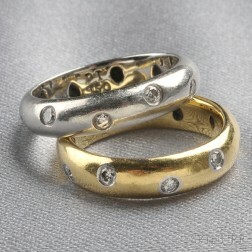 Platinum, 18kt Gold, and Diamond Band, Schlumberger, Tiffany & Co.